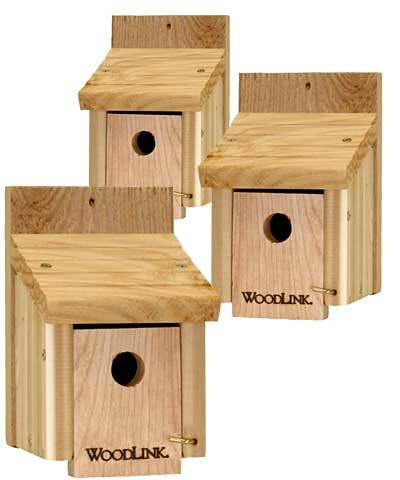 Invite several wrens to nest in your area with these Woodlink Cedar Wren Houses. This set of 3, traditional wren shelters provides roosting spots for a few avian families at once, while its cedar construction ensures durability. An extended back panel on each piece supports the downward sloping, lapped roof, and a predrilled hole on the top lip makes it simple to place the homes against a tree or post. The roof overhangs each 1" diameter entry hole, and a gap between the roof and front keep the home ventilated. This front panel lifts upward for nest checks or maintenance, and a latch keeps the door closed. An included cable on each unit allows you to hang it, rather than post mount it, lending both style and variety to the garden. The cedar construction remains hardy for many seasons, and its brown hue blends with the outdoors. Help small birds find shelter in your yard by placing this club package of Cedar Wren Houses in it. Made in the USA. Note: This case pack includes 3 of the Woodlink Cedar Wren Houses.